Andy and Barney steel themselves for the impending arrival of State Investigator Somerset (Robert Cornthwaite), a man notorious for his intolerance of any deviation from rules and regulations. It is Andy's hope that Somerset will allocate extra funds to keep the Mayberry courthouse afloat. Unfortunately, Opie has brought a stray dog into the courthouse-and before long the building is home to eleven yapping and yelping hunting hounds. 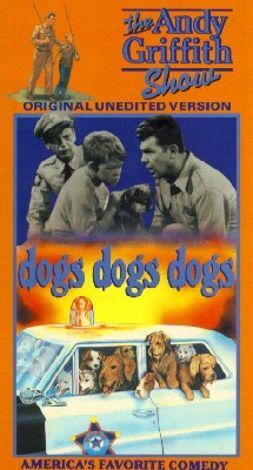 Written by Jim Fritzell and Everett Greenbaum, "Dogs, Dogs, Dogs" was originally broadcast on April 22, 1963.